In this lesson, students complete a Myers-Briggs Type Inventory of their personality type as an introductory step to understanding what green jobs might suit their personal styles. From the information on this online tool, they look at different green jobs to explore possible careers. This is not a content learning activity, but learning about STEM and energy-related job opportunities is relevant for middle and high school students. This activity can pair well with content about climate change and energy awareness. This activity invites collaborative teaching, such as between a science educator and a psychology educator, a business/career educator, or a technology educator. Interpretation of the results of the Myers Briggs Type Inventory could be sensitive for some students. Educators may want to work with a career counselor to address questions and/or concerns. For updated, nation-wide information on green careers consider using the US Dept of Labor website http://www.dol.gov/dol/green/. Does not teach science content. It focuses on green career opportunities. Comments from expert scientist: There is not much science to review in this resource. The resource is mainly about exploring green career paths. 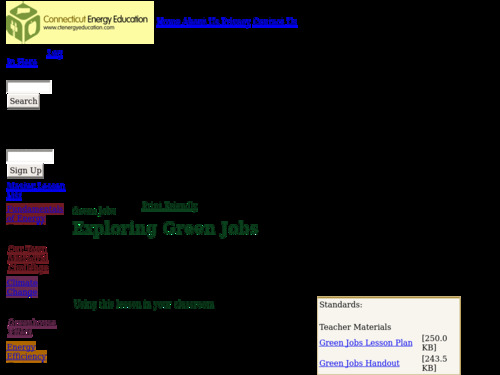 An excellent school to career project, focusing on green jobs. Activity is investigating green jobs - what kinds of education, training and/or certification are required, personality traits that might be a good match for kind of job, potential salary, etc. Activity engages students in matching their personality profile as measured by Meyers Briggs Type Indicator to a variety of green jobs and provides links to programs in Connecticut that offer education, training and certification in those jobs. Can be used with a wide variety of students. Links are provided to additional career information. The educator must register and log in to website to access the lesson plan and associated links. This is free and should not hinder the access or use of the activity.